How much should we rely on CMA from MLS to derive our purchase/list prices? Should we use CMA (Comparable Market Analysis’s) numbers generated from MLS (Multiple-Listing Services) to derive our purchase/list prices? The CMA generated from MLS provides an average Sold Price per Square foot for selected sold properties and average Listed Price per Square foot for selected Active and Pending properties. No absolutely not. The MLS generated CMA does not account for many factors that are important and should be included in a real CMA such as: condition of the house, upgrades, age, builders, size, layouts and floor plan, location of the house in neighborhood, and many more. All these factors need to be adjusted for all properties to match with the subject property. Condition of the Property: This is obvious that some houses are kept well and others not. e.g., the sold price or listing price of a foreclosure house with broken windows, doors, walls, tiles, woods, appliances, torn carpets, and etc cannot be used without many adjustments to compare with the subject property. Upgrades: When was the last time and what was the items were upgraded to are important in calculation of CMA. e.g., the upgrades in the kitchen such as counter Granites, appliances (energy Efficient), plumbing, etc. increase the value of the house. Age of the house: Depending on the age of house and difference between the age of the house and subject property it may or may not be need to adjustment. For example, if the subject property was built in 1980 and the comparable house was built in 1988, most probably you don’t need adjustment. 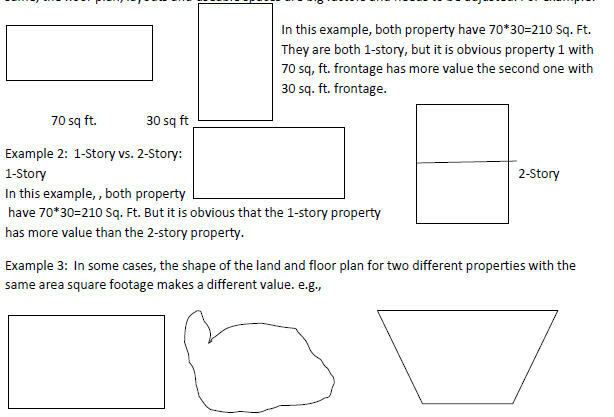 Whereas, if your s subject property was built in 2010 and you are comparing with a brand new house built in 2012, you need to make some adjustments. Builder: Though, on the surface and at first it doesn’t look important and most of the time is ignored, but in many cases the quality of workmanship and materials used which derives the built cost are very different from builder to builder. Size Square Footage: Buy size and layout I mean you should not compare for example the $price per square foot for a condo with 600 Sq Ft with another condo having 1300 Sq Ft. This needs adjustment. Assuming all other factors are the same; the smaller size houses, condos, etc. always have much more price/sq ft. than larger size house. The one-story houses always have more price/sq ft. than 2- or 3-story houses. They all have different values and depending the usage, view, etc could be higher or lower values. All these discrepancies and difference should manually be adjusted for each compared property to bring all properties to the same level for comparison purposes. How to adjust values? The adjustment values are different for each type of property, location, price range, type of addition or deletion, etc. Try to talk to your local appraisal to get the latest number in your area. You may visit my website www.TexasFiveStarRealty.com or click here to see some suggested adjustments value for properties in north Texas. Should we use Price per Square Foot to derive our purchase/list prices? The Price per Square Foot generated from MLS provides an average Sold Price per Square foot for selected sold properties and average Listed Price per Square foot for selected Active and Pending properties. No absolutely not. The Price per Square Foot generated CMA does not account for many factors that are important and should be included in a real CMA such as: condition of the house, upgrades, age, builders, size, layouts and floor plan, location of the house in neighborhood, and many more. All these factors need to be adjusted for all properties to match with the subject property. As a Client you will receive OLDCAR (Obedience, Loyalty, Disclosure, Confidentially, Accounting, and Reasonable Care). As a Customer you should be treated Honesty and fair. 1. We may view the property on buyer-client’s behalf. 2. We may show your property to our client-buyers. 3. We may gather information on buyer-client’s behalf. 4. We may prepare any offers on buyer-client’s behalf. 5. We may negotiate offers on buyer-client’s behalf. 6. We may assist our client-buyers in locating and obtaining financing or any other terms that benefit buyer-client. 7. We may work with all parties to solve problems and facilitate the closing. 8. We may provide our buyer-client assistance in coordinating inspections or surveys etc. 9. We will disclose any defects we know about the property. 10. We may relay to buyer all information that we learn from you. 1. Price counseling or prepare CMA (Comparative Market Analysis). 2. Any advice on how much to sell your property. 3. Any advice regarding property, showing tips, staging, etc. 6. Host an open house. 7. Any advice regarding positions to take during negotiations. 8. Any information that would be detrimental to the Buyer’s negotiating position or that is confidential, unless required by law to disclose.